For many men, January is a season for Bowl Games and hockey tournaments, but for men like me, January is a season for menswear. At the beginning of every year, the best menswear designers in the world showcase their Fall collections all across Europe. While some experiment with odd shapes and proportions for the sake of being punk (Rick Owens and Vivienne Westwood), others attempt to move menswear forward towards something that is both unique and marketable. This morning I met my good friend Ryne for a cup of coffee at our favorite coffee shop, and we got to talking about the direction of menswear in 2018. Ryne is perhaps the most fashionable man I know and is always sporting the latest Dior jacket or Louboutins boots. Today, he was doting over his new Sac De Jour bag. Earlier this week, Ryne’s husband Kenny surprised him with the most beautiful Saint Laurent bag I have ever seen, and I could not have been more jealous. We’ve both been lusting over it for months because it is simple yet chic, classic yet contemporary. It represents the best of fashion today. But instead of endlessly lusting over his new gift, we focused our attention to Paris Fashion Week—most notably, Kim Jones’s final collection for Louis Vuitton. 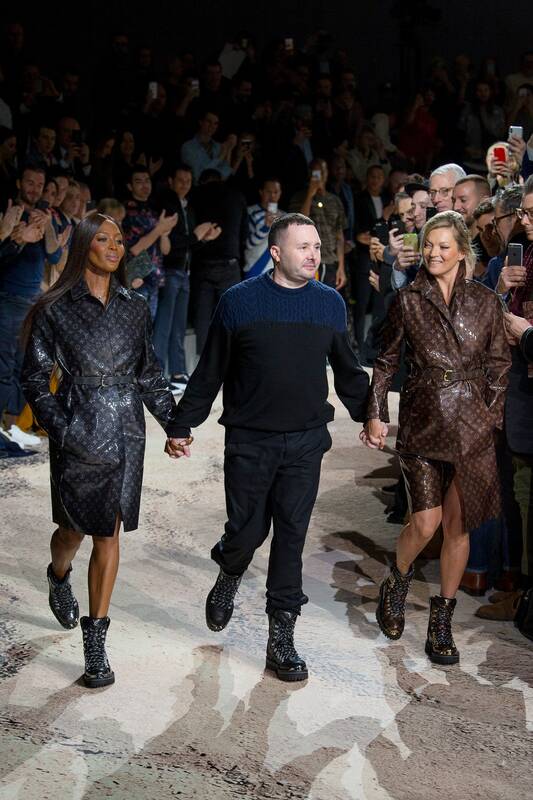 Kim Jones with Naomi Campbell and Kate Moss at the end of the Louis Vuitton Fall 2018 show in Paris. Under Jones’s leadership, Louis Vuitton continued to move into the mainstream spotlight that his predecessor, Marc Jacobs, lit up in the early 2000s. But unlike Jacobs, who truly reinvigorated the brand with exuberance, Jones’s mission for the French power house was to bring sensibility to aspiration—i.e. designer streetwear. View the entire Louis Vuitton Fall 2018 collection on vogue.com. Ever since the popularization of sportswear in menswear, fashion houses have been scrambling to find balance between the demand for athletic styles and the need to produce luxury goods—or to put it more simply, to find balance between making street clothes and something that requires a second mortgage. Ryne’s style is a perfect example of this. Today, he was wearing a collarless black button-up shirt and black denim by Jil Sander, a leather jacket by All Saints, and his new $3,000 Saint Laurent tote. And despite his head-to-toe sartorialism, he thought his outfit might look better had he just worn a simple t-shirt. I couldn’t help but wonder… since when could a t-shirt improve the appearance of an already tailored look? Now, let me be clear: I love streetwear. In fact, my everyday look is a black t-shirt and jeans. But lest I remind you I am a blogger who sits in front of a computer every day. I am not setting trends at Paris Fashion Week. The last few years have seen some successful streetwear collections, most notably Riccardo Tisci’s basketball-inspired Autumn/Winter ’14 collection for Givenchy and Yohji Yamamoto’s tenured collaboration with Adidas, but true innovation to the silhouette of men’s fashion has been null and void. These days, Everyman has traded in his suit for workout gear. Consequently, men have sought inspiration off the runaway from sources like Instagram, where art and taste have become synonymous with the number of followers one has. Classic beauty has been replaced with whatever can be digitally manipulated to look beautiful, and quality products have been replaced with imitations that are so identical they might as well be real. Case and point: Zara has become the largest fashion retailer in the world. In some sense, menswear has become a caricature of itself, with trendsetting designers creating collections for Instagram celebrities (Dolce & Gabbana) rather than for their inner creative muses. Sure, the last decade brought us the jogger to replace the tracksuit and the bomber jacket to replace the ill-fitted blazer—and that does count for something—but both of these styles are reproductions of 1950’s patterns. Neither are the genesis of invention. Paris Fashion Week was no exception. Fashion has always been a reflection of to the culture, and in turn, culture has always responded to fashion—be it positive or negative. But in recent years, it seems that menswear has become less of a reflection of men and more of a subservient Dr. Frankenstein to a cultural monster. Sweater by Alexander McQueen. Photo by Dan Austin Photography.